When we think of love in the movies, we often think of young love, physical love or idealized love. Our sources are typically romantic comedies or sentimental melodramas, which seek to invoke laughter or passion. But it’s rare for a movie to touch upon raw, brutal love - the somber kind where someone must face reality and sacrifice themselves for his or her mate despite the ensuing pain and heartache. They do it because love has become a force in their mind and body; it’s what compels them. Their motivations are no longer driven by romance or generosity, but by pure and whole bodied affection for the person they’ve grown old with. When someone truly loves another, they’re willing to do anything for them. 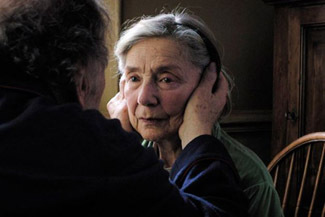 That’s why Amour (love) is the perfect title for Michael Haneke’s heartrending and shattering new film. I write “heartrending” and “shattering” but I’m actually at a loss for words on how to describe this film’s effect. It’s sad, emotional, and above all truthful, but these are only adjectives, which hardly encapsulate the experience of seeing it. To really appreciate this film, one need simply go into it with an open heart and watch. Haneke and his actors take care of the rest. The story is really very simple. Georges (Jean-Louis Trintignant) and his wife Anne (Emmanuelle Riva) are two retired music teachers in their 80s. They live in a spacious, high-ceiling apartment in Paris and are still active in the community (the film opens with them attending the concert of a former pupil). One morning at the breakfast table, without warning, Anne goes into a lethargic state. She’s silent and unresponsive, staring blankly into space. Georges figures she’s pulling a prank, but when she finally comes to, she has no recollection of what just happened.